I like this quotation. 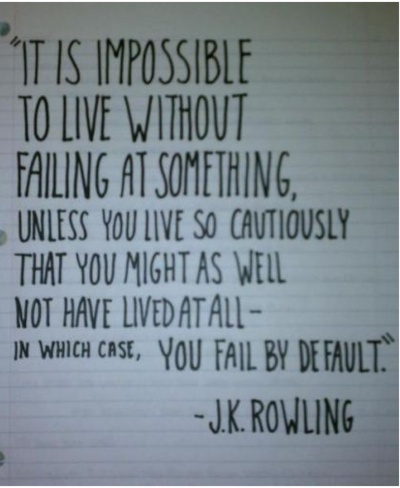 And J. K. Rowling is brilliant! In case you’re wondering what this is, which you probably are, this was a school assignment. Now before you click to the next page (all school assignments aren’t bad), let me say this: THIS WAS A FUN ASSIGNMENT! I had to write an epic, like Homer (if you don’t know who that is, google The Iliad or The Odyssey). This story is based on a true story. Thought you ought to know that (don’t you just LOVE unintentional rhymes?). Inspire me, oh Muses. Tell the tale of the hero of the grim brow, whom the gods despised and his wife, second in beauty only to Aphrodite. Let the song of this hero be sung again. Speak in and through me, Muses, and let your words flow through my mouth. The hero of the grim brow and his wife beautiful as Aphrodite and all their many children looked down at the river. In the heart of the forest, the silvery river slipped over the stones on the bottom of the riverbed, emitting a smooth, gurgling sound. Then before them a figure appeared dressed in a white robe, which folded about the figure gracefully. An olive wreath balanced on the figure’s fair hair, and the eyes were gray as a stormy sea. “I am Athena,” and her voice was condescending. “I am here to tell you what you must accomplish, oh hero of the grim brow. The gods are displeased with you. You are arrogant and full of wisdom, but your wisdom will never surpass my own. No mortal will ever reach the depth of my understanding, and you, oh hero, are no exception. All the gods on Olympus know you are the most arrogant hero ever to walk the earth. I have created this forest for you, to test your wisdom and arrogance. Of course, you already have realized this is a trap. I have spent many years now creating this trap, and I have had to use all my wits, but I assure you, my wits are far greater than your own. After all, I am immortal, and you are not. Pallas Athena smiled cruelly at her own cleverness, and she departed from the forest of darkness. Athena would not wait until dawn; she desired to examine the hero’s wisdom with her first test. She wished to discover the hero of the grim brow’s weaknesses. He may have wisdom, but is he brave, loyal, or humble? Thus, with these thoughts on her mind, Athena flew to ask Poseidon to begin the first test. The smooth, silvery water of the river in the forest was smooth no more. Churning and roaring, the waves of the river crashed upon the hero of the grim brow. The hero’s great strength saved him, else the waves would have dragged him under. A glad thing that he was not drowned, for his family, also would have perished. The hero of the grim brow scrambled up the bank and helped his beautiful wife to safety. But he had neglected his children. All four of his daughters and his small son were tossing and rolling in the river. The hero’s glorious wife screamed a cry of anguish, for she knew her children were slowly drowning. The hero of the grim brow, not wasting a moment, dove into the river. Strong though the hero of the grim brow was, the currents were much stronger. He clutched wildly at his little son as he was nearest to his father. Catching him up in his strong arms, he managed to toss his little son to his wife on shore. Then, the waters crashed upon him, and the noble hero was forced under the water. When next the hero came above the surface again, he grabbed one of his daughters, and his wife dragged her ashore. The other three daughters were tumbling down the river with the current. Swimming as fast as he could, the hero of the grim brow reached the point where his daughters were. He grabbed all three and walked up the raging river, using all his strength against the current. Still holding his daughters, he jumped and landed on the riverbank. The family sat for some time, sobbing to think of what might have happened. Alas, the hero of the grim brow lay on the riverbank, completely drained of strength. Yet Pallas Athena was still displeased, so she sent another adversity for the hero to conquer. On the wings of the wind, Pallas Athena sent a message to the hero of the grim brow. Pallas Athena had created this riddle to trick him. The true answer was almost impossible to discover. It was a full year before the goddess found a sufficient answer. This mortal would never find the answer. If he never learned the answer to the riddle, he would never leave the forest. For a long while, nothing happened. The hero of the grim brow almost abandoned all hope of ever leaving the forest. Athena was not finished testing the hero, however, so she sent one final test. Yet this final test never came, for Zeus, king of the gods, perceived the hero’s true wisdom, bravery, and modesty. The king of the gods decreed that Athena release the hero of the grim brow and his family from their awful prison. Thus, Zeus revealed the way out of the horrible forest to the hero of the grim brow. So the hero of the grim brow and his children and wife returned home. But never did the gods or goddesses endeavor to test him again, for he had proven himself humble yet wise.